In October 2012 Six Flags Over Texas removed Texas Chute Out in spectacular fashion. The ride was imploded and actually landed into the area that had formerly held the Flashback! roller coaster (removed shortly prior to Texas Chute Out). This isn’t the first attraction imploded at Six Flags Over Texas. Wildcatter actually had the same fate in 2007. From 1977 until 1994 Texas Chute Out featured six stand up baskets and six sitting baskets. This created quite the unique ride experience. 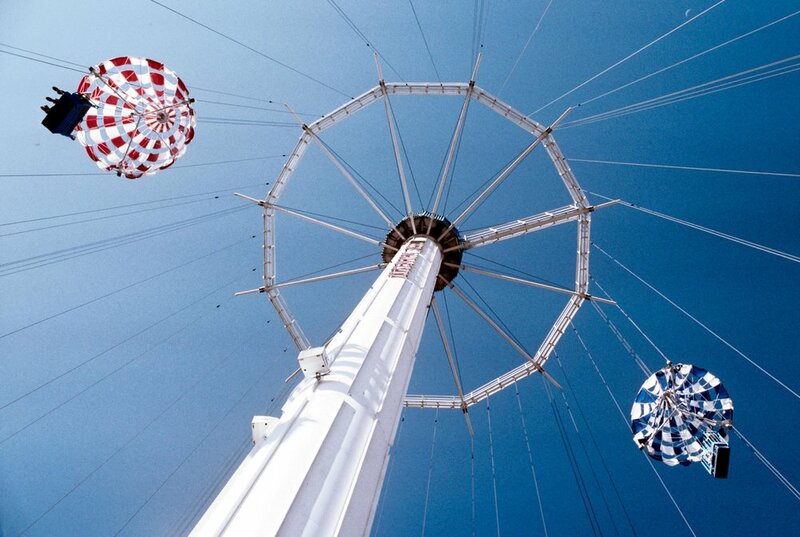 Guests could board one of these baskets and get a bird’s-eye view of Six Flags Over Texas from nearly 170 feet up in the air. The baskets were removed in 1994, likely as an enhanced safety measure. After the removal of stand up baskets, Texas Chute Out had a total of eight sitting baskets. Pictured are the stand up baskets in action in the early 1990s. Stand up baskets are introduced on Texas Chute Out. Stand up baskets are removed from Texas Chute Out.